The Chin Chronicles: the elephant in the room. It seems that the old adage rings true: The most creative minds among us often have the most persuasive demons. Day in, day out I live a seemingly stable existence. Preaching about enjoying the simple things in life yet oftentimes unable and frequently unwilling to take heed of my own advice. Being cognizant of the proverbial writing on the wall is completely useless unless you're willing to act upon it. It becomes an act of self-deprivation and ultimately self-destruction. Yet I seem to be so exceedingly good at convincing myself of grasping at ethereal hopes that at times I can't even differentiate reality from dream. This trait is helpful at times. A loose grip on reality eases the blunt force trauma that life is known to cause. Some might even call it optimism. 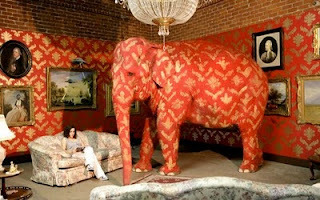 However, one can only go so long ignoring the elephant in the room before the elephant starts to make it's presence known. Before long, it's very existence becomes suffocating and constricting. ...and you begin to wonder why it took so long to bring up in the first place. to see what they are supposed to be.